Choline is involved in the synthesis of phospholipids, including blood lipids, and is the immediate precursor of betaine, which serves as a methyl group donor in a reaction converting homocysteine to methionine. Several cardiovascular risk factors are associated with plasma homocysteine, whereas little is known about their relationship to choline and betaine. We examined the relation of plasma choline and betaine to smoking, physical activity, BMI, percent body fat, waist circumference, blood pressure, serum lipids, and glucose in a population-based study of 7074 men and women aged 47-49 and 71-74 y. Overall plasma concentrations (means +/- SD) were 9.9 +/- 2.3 micromol/L for choline and 39.5 +/- 12.5 micromol/L for betaine. Choline and betaine were lower in women than in men and in younger subjects compared with older (P < 0.0001). Multivariate analyses showed that choline was positively associated with serum triglycerides, glucose, BMI, percent body fat, waist circumference (P < 0.0001 for all), and physical activity (P < 0.05) and inversely related to HDL cholesterol (P < 0.05) and smoking (P < 0.0001). Betaine was inversely associated with serum non-HDL cholesterol, triglycerides, BMI, percent body fat, waist circumference, systolic and diastolic blood pressure (P < 0.0001 for all), and smoking (P < 0.05) and positively associated with HDL cholesterol (P < 0.01) and physical activity (P < 0.0001). Thus, an unfavorable cardiovascular risk factor profile was associated with high choline and low betaine concentrations. Choline and betaine were associated in opposite directions with key components of metabolic syndrome, suggesting a disruption of mitochondrial choline dehydrogenase pathway. Choline is activated first by phosphorylation and then by coupling to CDP prior to attachment to phosphatidic acid. PC is also synthesized by the addition of choline to CDP-activated 1,2-diacylglycerol. A third pathway to PC synthesis, involves the conversion of either PS or PE to PC. The conversion of PS to PC first requires decarboxylation of PS to yield PE; this then undergoes a series of three methylation reactions utilizing S-adenosylmethionine (SAM) as methyl group donor. Choline is activated first by phosphorylation and then by coupling to CDP prior to attachment to phosphatidic acid. cell transformation, and tumor progression. Relationship between phospholipid metabolism and the cell cycle. G1 phase is characterized by a high rate of PtdCho degradation and resynthesis that is dependent on growth factor and terminates at the G1/S boundary. Doubling of the phospholipid mass occurs in S phase due to continued phospholipid synthesis but with drastically reduced phospholipid turnover. The turnover of nuclear polyphosphoinositides is an additional S phase event that may be a component of a regulatory network that governs DNA replication. The G2 and M phases are characterized by the cessation of phospholipid metabolism. response to activators of the CDP-choline pathway. Thus, substrate channeling of the CDP-choline produced by CTP:phosphocholine cytidylyltransferase to nuclear located CEPT1 is the mechanism by which upregulation of the CDP-choline pathway increases de novo phosphatidylcholine biosynthesis. assignment of specific amino acid residues as structural requirements that directly alter either phospholipid head group or fatty acyl composition. This pinpointed glycine 156 within the catalytic motif as being responsible for the dual CDP-alcohol specificity of CEPT1, whereas mutations within helix 214–228 allowed for the orientation of transmembrane helices surrounding the catalytic site to be definitively positioned. (1). The majority of the body's choline is found in specialized fat molecules known as phospholipids, the most common of which is called phosphatidylcholine or lecithin (2). Choline and compounds derived from choline (i.e., metabolites) serve a number of vital biological functions (2-4). Choline is used in the synthesis of the phospholipids, phosphatidylcholine and sphingomyelin, which are structural components of all human cell membranes. The choline-containing phospholipids, phosphatidylcholine and sphingomyelin, are precursors for the intracellular messenger molecules, diacylglycerol and ceramide. Two other choline metabolites, platelet activating factor (PAF) and sphingophosphorylcholine, are also known to be cell-signaling molecules. Phosphatidylethanolamine (PE) is the most abundant lipid on the protoplasmatic leaflet of cellular membranes. It has a pivotal role in cellular processes such as membrane fusion, cell cycle regulation, autophagy, and apoptosis. 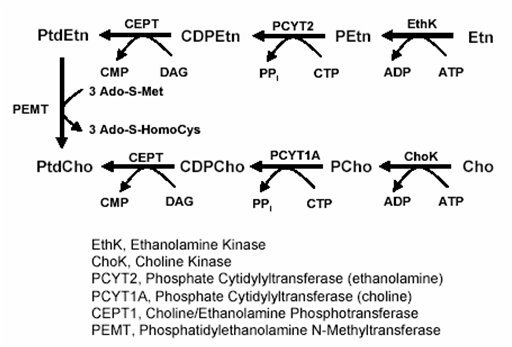 CTP:phosphoethanolamine cytidylyltransferase (Pcyt2) is the main regulatory enzyme in de novo biosynthesis of PE from ethanolamine and diacylglycerol by the CDP-ethanolamine Kennedy pathway. The following is a summary of the current state of knowledge on Pcyt2 and how splicing and isoform specific differences could lead to variations in functional properties in this family of enzymes. Results from the most recent studies on Pcyt2 transcriptional regulation, promoter function, autophagy, and cell growth regulation are highlighted. Recent data obtained from Pcyt2 knockout mouse models is also presented, demonstrating the essentiality of this gene in embryonic development as well as the major physiological consequences of deletion of one Pcyt2 allele. Those include development of symptoms of the metabolic syndrome such as elevated lipogenesis and lipoprotein secretion, hypertriglyceridemia, liver steatosis, obesity, and insulin resistance. The objective of this review is to elucidate the nature of Pcyt2 regulation by linking its catalytic function with the regulation of lipid and energy homeostasis.